Voters actually like dynasty, and the Congress must wear it as a badge of honour. If there’s any BJP voter thinking of switching over to the Congress, Prime Minister Narendra Modi has a reminder: all power in the Congress is concentrated in the hands of one family. On Prime Minister Narendra Modi’s charge that a non-Gandhi cannot be president of the Congress party, P. Chidambaram pointed out names of non-Gandhi party presidents before and after 1947, and also examples of people like Manmohan Singh and P.V. Narasimha Rao whom the Congress made prime minister although they did not come from the Nehru-Gandhi family. His defence didn’t work because PM Modi only furthered his attack, reminding everyone how Sitaram Kesri was humiliated by the Congress, his office physically taken over by Sonia Gandhi loyalists in a coup. The Congress party cannot claim to be democratic in its internal leadership, because it is not. It is not an argument they can win. In doing so, they come across as apologising for being led by a political dynasty. It is strange that they should apologise for their only USP, the Nehru-Gandhi dynasty. It’s a charge the Modi-led BJP is making every single day to discredit the Congress. By defending itself, the Congress only falls into the trap. The truth is that Indian voters don’t care about dynasty. If anything, it helps voters trust a politician, knowing s/he comes from a political family they have trusted in the past. Why, just look at the number of dynasts who’ve been given tickets by the BJP for the Madhya Pradesh elections. Every fifth winner in the 2014 Lok Sabha elections was a dynast. Across the country, in every state and every party, political dynasties are flourishing. Fifteen of 75 ministers in the Modi’s council of ministers are political heirs, as per a September 2017 report. From Yogi Adityanath to Devendra Fadnavis, from Vasundhara Raje to Pema Khandu, from Maneka Gandhi to Varun Gandhi, the BJP is full of leaders who could get into politics thanks to their surnames. It is strange that Amit Shah should run the BJP like a cabal of families and then accuse the Congress of being a family enterprise. Political dynasts must be bringing something to the table that Indian voters place so much trust in them. You could argue that Indian politics isn’t that open to outsiders, but it is rare to meet a voter who says s/he is not voting for a politician because s/he is a dynast. Instead, one only sees dynasty re-imposing trust. You’ll typically hear people say ‘purane neta they hamare, bohot kiya hamare liye, ab unka ladka aaya hai, us hi ko vote denge’(He was an old leader of ours, he did a lot for us, now his son is contesting. We’ll vote for him). The case of Vasundhara Raje Scindia is rather funny. She comes from the Scindia family of Gwalior in Madhya Pradesh, which is better known for being part of the Congress. Her son is a BJP MP too, carrying forward her own political dynasty. And she recently complained about how the Congress party is controlled by four members of the Gandhi family! The BJP’s hypocrisy is proof that its attacks on the Nehru-Gandhi family are only meant to put the Congress on the back foot in the narrative wars. Every time the Congress takes the bait, it does itself a disservice, making it look weak and the BJP stronger. Often the BJP doesn’t even have to try. Rahul Gandhi goes abroad and gives interviews to NRI academics in which he almost sounds like saying ‘I’m sorry for being a dynast’. Instead of apologising for being from the Nehru-Gandhi family, Rahul Gandhi should boast about it. The Nehru-Gandhi dynasty is the only USP of the Congress party. 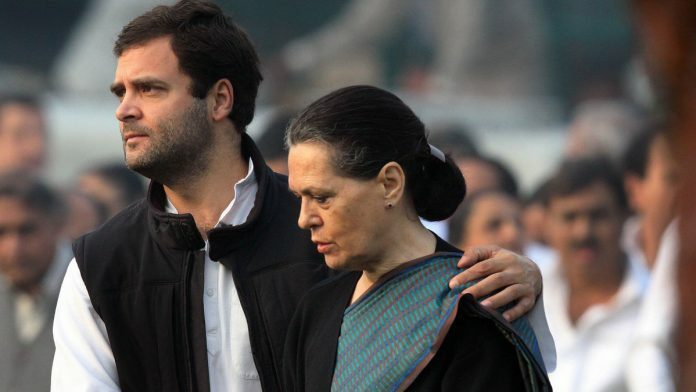 Had it not been for the Nehru-Gandhi family, there would have been no Congress party left. The reason why Congressmen begged Sonia Gandhi to take over the reins was because it was collapsing like a pack of cards under Narasimha Rao and Sitaram Kesri. Instead of counting the non-Gandhis who have led the Congress, P.Chidamabaram should say he’s proud to be led by the Nehru-Gandhis. Two members of this family laid down their lives for India. Nehru spent almost nine years in jail to fight for India’s freedom. He was made the Congress president for the first time on the recommendation of Mahatma Gandhi, whom Mr Modi has been trying to appropriate. Like all influential leaders, the Nehru-Gandhis are a mixed bag of some great achievements and some poor choices. Yet, you’ll find none other than the Hindutvawadis abusing them. People old enough to remember Nehru, Indira or Rajiv only remember them fondly. Instead of apologising for the surname, the Congress should launch a campaign taking ownership of the dynasty. Perhaps, the most amazing dynast till date has been Sonia Gandhi, who managed to displace a towering BJP leader like Atal Bihari Vajpayee. Under her leadership, the Congress ruled India for 10 years recently, and voters did not buy the BJP’s ‘Italian’ rhetoric about her. It is only by resurrecting Nehru, Indira and Rajiv as icons of modern India that Rahul Gandhi can revel in some inherited glory. Short of achievements in his own CV, Rahul Gandhi can sell himself to voters as the heir of a family identified with India’s freedom, democracy and progress over the decades, warts and all. An earlier version of this article erroneously stated that 15 of 75 ministers in Modi’s cabinet are political heirs. It has been updated to ‘council of ministers’. This sounds pretty bogus, illogical and somewhat hilarious and feels like somewhat fictional at the same time. What precise distinction are you trying to make by substituting ‘Modi’s cabinet’ with ‘council of ministers’? I completely agree with the author. I have one more point to add. The obvious drawback of a political dynasty is that it cannot produce talent in every generation. What about the party that mobilises votes on religious grounds? They cannot ever produce any talent. The logic of leadership formation in BJP is the degree of fanaticism that the aspirant can generate. That is how a man who presided over the killings of thousands of innocent people becomes the Supreme leader. Where is the talent? Shivam, are u endorsing the concept of dynastic politics, or just analyzing the minds of the Indian voter ? I am sure you are not the one who will eulogize a dynastic tradition in a thriving democracy ? You need to make this clear, and also let us know if you are slowly becoming a Congress supporter and advocate of Congress Regime for 2019 ! “… if you are slowly becoming a congress supporter ” … He is a teflon coated congress chamcha .. if you read about 10 of his articles .. ( may be 10 is not enough .. but 10 is a good number )… you would have known. We have a saying, ” chaasinsi maroo hoondoksi matong ” , it says when you try to swallow it(piece of meat), it turns into bone and when you are about to throw it away it turns into flesh. And this is what dynasty in Indian politics is about. Well said! If Modi had two martyrs in his family he would have gloated no end over that. And if he had such a distinguished great-grandfather to boast of, he would have milked it to death! Indeed, Congress needs to change the narrative to its advantage. From music (think Daagar brothers) to tennis (think Amritraj) to science (think the Curies) and definitely politics – dynasties are not new. What matters is not whether you were born with the silver-spoon or not – what matters is what you did with the opportunity given to you. Gandi always had his heart in the right place and now is definitely proving his merit. Congress already milked Nehru, Indira & Rajiv’s. There is nothing to milk further. That’s why Congress is on defense when comes to dynasty. What has Rahul done to show that his heart is in the right place? Flying off to undisclosed destinations; not taking any responsibility under a highly qualified (if not truly competent) Dr. Manmohan Singh; not setting an example with Amethi; not becoming a CM to show what positive things he can achieve with the absolute power his family has?? Please leave Modi aside and answer these questions in an objective manner. In Marathi we have asaying which rpighly translates like only an incompetent fool rests on his father’s accomplishments. Can the writer elaborate RahulG’s accomplishments please ? The Congress party has nothing but its dynasty – no real vision, no policies for taking India forward, for her to find her place in the league of nations. No real ideas about anything. The author is right – it should cling on to its dynasty in much the same way as the musicians were playing the violin whilst the Titanic was sinking. Let it sink. Good riddance. Only problem is Congress is that it depends on only on one Dynast. But BJP can have CM/PM from dynast as well as nondynast. Raising an issue does not mean it will resonate. I am an old fogey and have good general knowledge; doubt if even 10% of Indians can recall Sitaram Kesariji’s telegenic visage. At the end of term, voters expect a solid Report Card. All these old cliches about the Congress being corrupt, the BJP being communal, our 2002 vs your 1984 are now history. 2. As for Shri Rahul Gandhi, his surname gets him the top slot in the Congress Party. Whether that ought to be the case is an internal matter of the Congress. People are now sizing him up. He does not look or sound like Pappu. There is still some nostalgic talk about Priyanka Lao, but succession within the family has been settled by the matriarch. What Mr Gandhi should be talking about is his grounded in reality vision for the future of the country, the concrete solutions / programmes the party has in mind to solve the country’s daunting problems. 3. An excessive focus on personalities has seldom been a good idea, it often comes in the way of real achievements. I agree with all that you have written, save one point: ‘Rahul does not look or sound like Pappu’. What exactly has he ‘evolved’ into, then? Daily repetitions of the same inane, childish jibes at Modi like a schoolboy mocking and complaining against a classmate? Driving ad nauseam, the silly ‘Suit Boot’ barb ( as if Congress always ONLY worked for the poor and the deprived, and shunned the Industrialists! ), using abusive words like ‘Chor’ to attack the PM, when scams and scandals were exploding around the UPA regime for ten years and the Rafale allegations really have NO TEETH but only innuendos? Mishandling EVERY alliance, MGB and relationship with potential allies, ONLY because of the unshakable smugness and arrogance that been the Congress hallmark ever since independence? Does Rahul really believe that such cheap jibes and one liners, which draw claps and adulations from his sycophants within Congress, but completely fail to impress and arouse the ‘VOTERS’, is the only path to a sure occupation of Modi’s chair? And, the real pathetic situation: no one in the Congress ( although there are many there who are able and competent, besides being sharp readers of the political scene) dares to ‘expose’ that he has ‘no clothes’, only because they are sacred of losing their own ‘positions’ and ‘prospects’. Seriously! In which India are you leaving. The most todays youth whether Hindi or Muslim, Educated or Uneducated, Urban or rural living, and at last Pro-Modi or not hates dynast politicians and especially who haven’t proven anything like RG.